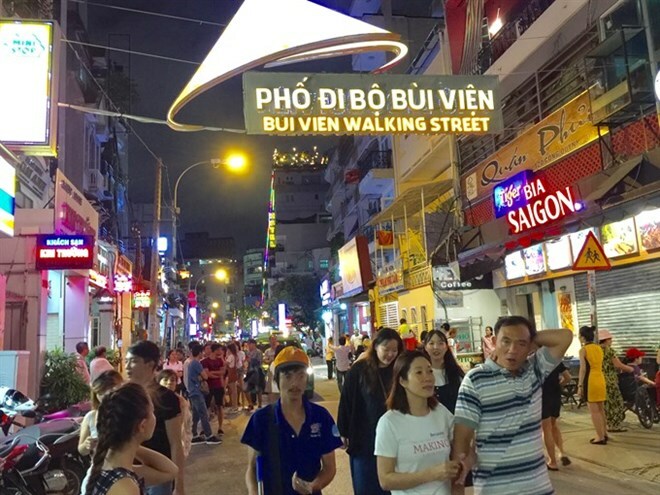 HCM City (VNA) - Thousands of local and foreign tourists flocked to Bui Vien Walking Street in the popular backpacker area of HCM City’s District 1 as it officially welcomed walkers at its grand opening on August 20’s night. The street is reserved exclusively for pedestrians from 7pm to 2am at weekends. During this time, vendors are allowed to display their merchandise on the pavement, but not on the road. Two stages for live music performances are also set up at the two ends of the street, promoting both Vietnamese folk songs and international music. In addition, tourists can enjoy free Wi-Fi services, public toilets and other tourist-related services. Foreign visitors have already praised the street for selling “cheap beer” and “providing good services”. “The food is amazing as always. Vietnamese beer is very good. Saigon beer is the best,” she said. Located in Pham Ngu Lao ward in District 1, the city’s new pedestrian street is expected to offer local residents and tourists a range of entertainment activities. Since the middle of July, authorities in District 1 have piloted a vehicle ban from 7pm to 2am on weekends, while also carrying out upgrades to pavements along the street. While eateries, cafes, clothing stores, and souvenir shops are open to customers in the morning and afternoon, restaurants, bars, and pubs bring a more exciting atmosphere to the street from the evening until midnight. Some 146 businesses are operating on Bui Vien street, said Nguyen Thi Thu Huong, Vice Chairwoman of the District 1 People’s Committee. Among them are 23 hotels, 25 eateries, 15 cafes, 33 souvenir, handicraft, and clothing stores, 14 pubs, 9 beer bars, 12 salons, 8 travel agents, among others. Opening specialised streets has been an emerging trend in the city, improving trade and services as well as creating distinctive tourism products for the city. In 2015, Nguyen Hue Boulevard, the city’s first pedestrian street, opened to visitors and has become a popular venue for both locals and tourists at the weekend. Nguyen Van Binh, the city’s book street, has also been a popular stop for local bookworms and visitors. According to Vice Chairman of the municipal People’s Committee Tran Vinh Tuyen, local authorities will do their best to make the pedestrian street attractive to both local and foreign visitors.